The byelaw requires whelk fishers to have a permit to fish for whelks and to fish in accordance with flexible permit conditions. Whelk permits are issued annually and expire on he 31st March each year, regardless of when fishers applied or received a permit. Fishers who intend to continue fishing after 31st March each year need to apply for a new whelk permit. buoys must be set so as to remain fully afloat and clearly visible at all times. Fishers must not use an edible crab (also known as brown crab) for bait including parts of edible crab or cooked offal. This is set out in Byelaw 5: Prohibition on use of edible crab (Cancerpagurus) for bait. Holders of a Whelk Permit are required to complete returns forms issued by Eastern IFCA. These are to be completed each month including when no fishing has occurred. Permit conditions are issued, varied or revoked through the process set out in Schedule 1 of the byelaw. This includes a consultation and the production of an impact assessment. Escape holes in pots All whelk pots must include a minimum of two escape holes that are positioned at least 150mm from the base of the pot or no more that 50mm from the top of the pot. These escape holes must be of a size that a bar, the diameter of which is 24mm, will pass freely through. Escape holes must not be obstructed by any means. For more information on whelk fishing within the district (including on how to apply for a permit) please click here. The Authority for the Eastern Inshore Fisheries and Conservation District in exercise of its powers under sections 155 and 156 of the Marine and Coastal Access Act 2009 makes the following byelaw for the District. q) ‘whelk pot’ means a pot or trap set for the purpose of catching whelks. b) a named representative, nominated by the holder of a whelk permit; and must undertake fishing or related activities in accordance with any flexible permit conditions issued by the Authority. A person must not retain on board, tranship, land, transport, store, sell or display or offer for sale whelks caught from within the District which are smaller than the minimum length specified within the flexible permit conditions as measured in accordance with Schedule 2 but must return such immediately to the sea. A person must not fish for whelks under the authority of a permit from a vessel other than the vessel named on that permit without firstly obtaining the agreement of the Authority. Such agreement may be given in circumstances where the permit holder, named representative or the named vessel are unable to put to sea. A person must not use fishing gear other than a whelk pot in fishing for whelk. d) buoys must be set so as to remain fully afloat and clearly visible at all times. The holder of a whelk permit must submit to the Authority, no later than the 10th day of each month, such information relating to the previous month as is required by the Authority on forms which will be provided by the Authority. b) issue a Category Two Permit to the owner of a vessel which is not a registered fishing vessel, or to a person fishing for recreational purposes other than from a vessel. Only one whelk permit may be issued in respect of each vessel, which will be named on the whelk permit, and any change in ownership of a vessel cancels that permit. Only one whelk permit may be issued to each person without a vessel. Whelk permits are not transferable. Application for a whelk permit must be made using printed forms available from the Authority. These forms will require applicant and vessel details. The applicant may nominate up to 2 persons as their named representatives whose details must also be entered on the application form. Permits will be valid from the date of issue until the following 1st of April. The Authority may restrict the number of whelk permits issued and may set criteria to restrict eligibility for a whelk permit in accordance with the procedure set out in Schedule 1. A fee will be charged for each whelk permit which must be paid prior to the issuing of a whelk permit. b) £0.50 per pot for a whelk permit for more than 100 pots. The fee for a Category Two Permit is £5 per pot. The Authority may attach to permits flexible conditions which fall within one or more of the categories listed in paragraph 20. The Authority may issue, vary or revoke flexible permit conditions following a review conducted in accordance with the procedure set out in the Schedule 1. Whelk permit tags will be issued with an associated whelk permit will only be valid for the period that the whelk permit is valid and for fishing in relation to that permit. Whelk permit tags are not transferrable and must be surrendered to the Authority immediately if no longer required by the person to whom they are issued. Lost whelk permit tags must be reported to the Authority within 21 days of the loss. Whelk permit tags which are reported as lost are no longer valid. The holder of a whelk permit may apply for replacement whelk permit tags for whelk permit tags that have been lost. Claims for replacement of less than 20% of whelk permit tags issued to the holder of a Category One Permit, or for any whelk permit tags issued to the holder of a Category Two Permit, will be considered by the Chief Executive Officer of the Authority or a nominated deputy. Claims for replacement of more than 20% of whelk permit tags issued to the holder of a Category One Permit will be considered by either the Chairman or the Vice Chairman of the Authority and either the Chief Executive Officer or a nominated deputy. An appeal may be made to the Authority if an applicant feels that their claim has not been properly dealt with. The replacement of whelk permit tags will be at a cost of £0.30 per whelk permit tag. d) consideration by the Authority of all information arising from subparagraphs (a) to (c) above. The Authority must review flexible permit conditions and restrictions of the issuing of whelk permits no less frequently than every four years after the date that a flexible permit condition or restriction on the issuing of whelk permits has taken effect. The review of flexible permit conditions or restrictions on the issuing of whelk permits will be in accordance with a formal operational procedure agreed by the Authority and will include the steps set out in paragraph 1. Where restrictions on the issuing of permits or flexible permit conditions are issued, maintained, varied or revoked whelk permit holders will be notified in writing. The length of a whelk will be measured as shown below. 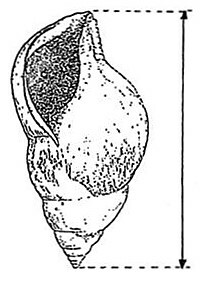 The length of a whelk is determined as above regardless of any damage which would reduce its length. This byelaw requires people who fish for whelks within the District to obtain a whelk permit. They are also required to fish in accordance with any flexible permit conditions issued by the Authority. The byelaw requires that only whelk pots may be used for targeting whelk and requires pots to be tagged with tags provided by the Authority. Gear must also be marked with buoys which are visible at all times and have the vessel’s port letters and numbers and whelk permit number also clearly visible. A fee is payable to the Authority for the issuing of a whelk permit. The minimum charge is set at £50 for a Category One Permit (commercial fishing) and £0.50 per pot for more than 100 pots. The charge for a Category Two Permit (recreational) is £5 per pot. If pots and tags are lost, permit holders may apply for replacements. A charge of £0.30 per replacement tag is payable to the Authority. If a Category One Permit holder wishes to replace in excess of 20% of their tags the Chairman or Vice Chairman and the CEO or a nominated deputy will consider whether to replace the tags. The number of whelk permits which will be issued by the Authority can be restricted. The Authority can also set criteria to determine which applicants are eligible for a whelk permit. This byelaw also allows the Authority to implement flexible permit conditions which will reflect best available evidence. These permit conditions will be used to protect fisheries and the environment and to ensure long-term, sustainable fisheries. To implement any restrictions on the issuing of permits or introduce, vary or revoke permit conditions the Authority will carry out a consultation with potentially affected stakeholders and produce an Impact Assessment which will be considered by the Authority. The Authority must also review any restrictions on the issue of whelk permits or flexible permit conditions once every four years as a minimum.